Want help with home preschool? Number cards can be used in a variety of ways during early childhood math activities. Not only can you use them to practice number recognition, they can be used in various ways to help with counting and the development of number sense. To keep things fresh and exciting you can switch out the number cards and the manipulatives you use from time to time. 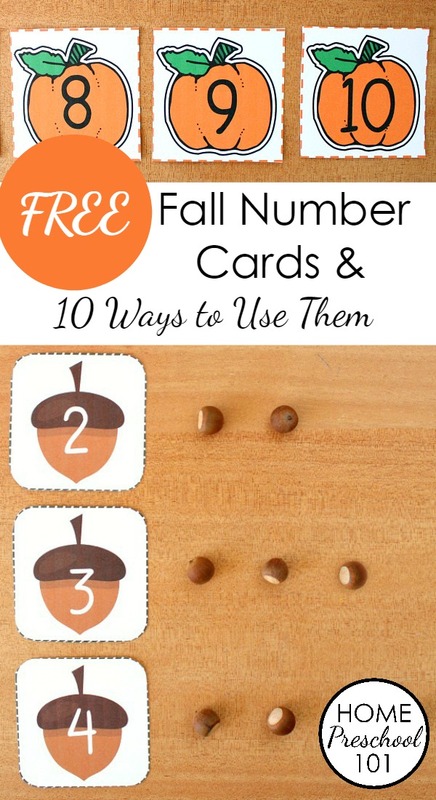 Along with some great ideas for using number cards for home preschool we’re giving you free printable fall number cards to get started with these activities today. Use them as calendar cards in your home preschool calendar. Changing out calendar cards with seasonal themes can be a fun way to renew interest in calendar activities. Match numbers and sets. Give kids small manipulatives and a set of number cards to match. Limit the cards included based on the child’s current understanding of numbers. Make it even more fun by matching the theme of the cards with the manipulative. For the apple cards, try using apples seeds, brown foam cutouts of apples seeds, or apple colored pom poms, glass gems, or foam circles. With the leaf cards, use real leaves, small table scatter leaves like the ones here, or foam leaf stickers. 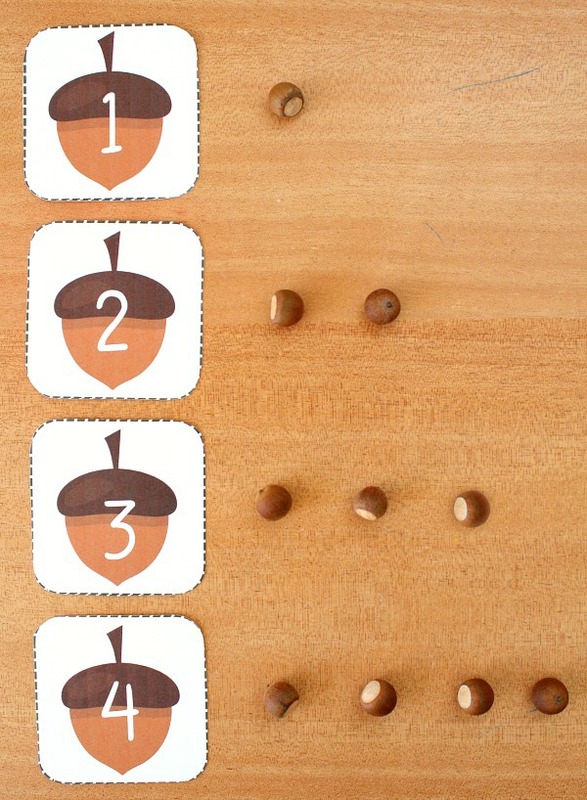 For the acorn cards, use real acorns or brown pom poms. With the pumpkin cards, use pumpkin seeds, pumpkin table scatter, or foam pumpkin stickers. Take a set of number cards and put them in numerical order from least to greatest (counting forward). Remember to start with smaller sets of number and add new numbers as your child is able. Take a set of number cards and put them in numerical order from greatest to least (counting forward). Once your child can sequence all the numbers in order well. Give him or her sets that do not include all numbers in order (i.e., 2, 5, 6, 9). Have the child put those in order from least to greatest. Sort by number. Print out all four sets of free printable calendar cards. Use smaller sets to begin with. Have kids sort the set by number so that all the number 1 cards are together, all the number 2 cards are together, etc. Play war. Combine multiple sets of number cards. For example you could use numbers 1-10 of all four sets of free printable calendar cards. See full directions on how to play war here. Play Go Fish. As in war combine multiple sets of number cards to play this traditional game. Play Higher or Lower Go Fish. Play this game like Go Fish except instead of asking for a number that matches kids will ask for a number that is greater than (or less than) a certain number. Go on a number scavenger hunt. Hide the number cards around the room. Have kids find all of them and put them in order to check to see if all of them have been found. Did we forget anything? How else would you use number cards for home preschool? 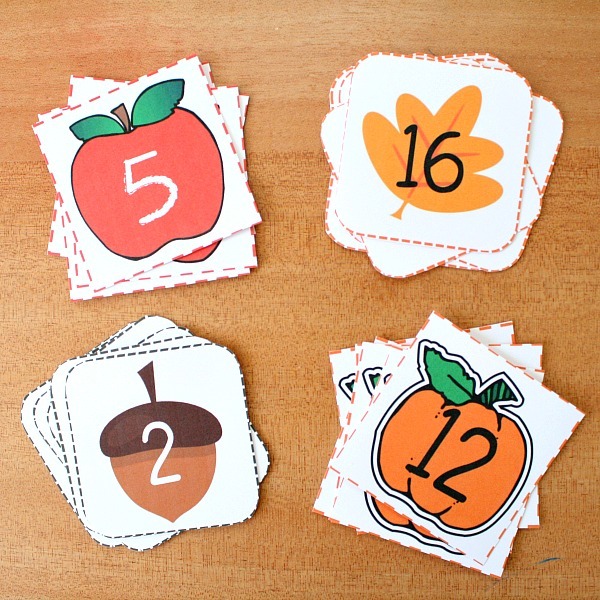 The free printable fall number cards include a 26-page set of number cards for apple, leaf, acorn, and pumpkin themes. 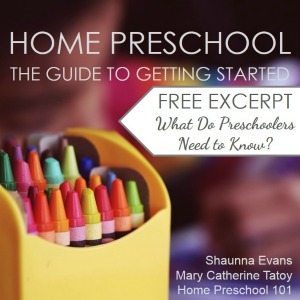 Looking for time-saving ideas and ongoing support for home preschool? Enter your email address to get help from Home Preschool 101.